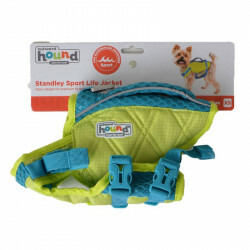 Pet Mountain's Dog Life Jacket & Safety Gear store features top quality products from the most trusted names in dog care, including Paws Aboard, Outward Hound and EzyDog. The EzyDog Doggy Flotation Vest is available in all different colors and helps your dog tackle the open water in style! With 50% more flotation foam than other floatation devices, this lightweight flotation vest with highly buoyant material is specifically designed to offer great comfort, security and style. 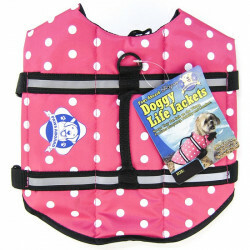 The incredibly buoyant foam is strategically placed in the vest to help your dog maintain a natural swimming position. The comfortable neoprene straps are adjustable so you can find the perfectly snug fit for your dog. With bright colors and reflective details on this life preserver, you'll have better visibility of your pooch, both day and night. The durable design and ergonomic grab handle ensures you can scoop your dog out of the water at anytime. Your dog will be safe, comfortable and stylish out on the water with EzyDog's Doggy Flotation Vest. 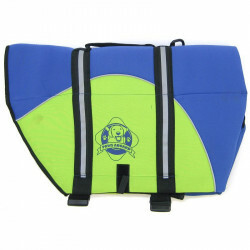 The Outward Hound Pet Saver Life Jacket is a high performance dog flotation device for boating, water sport adventures and other outdoor activities with dogs. Provides flotation and ultimate buoyancy with bright colors for easy visibility. Water repellent neoprene and corduroy materials provide warmth and protection from abrasion. Design allows fast size adjustment and a flexible comfortable fit. 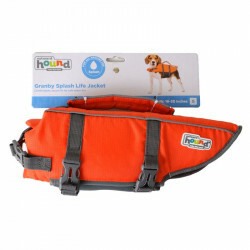 The orange Outward Hound Life Jacket is made with both comfort and safety in mind. This multi-handle designed life jacket makes pulling your dog out of the water easy, and is stronger and durable than other flimsy life jackets. 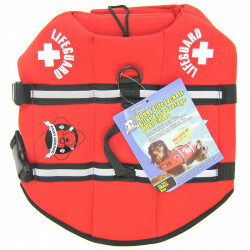 This quick drying dog life jacket with adjustable straps and top handles also features bright colors and reflective accents for a high visibility rate when you're out on the water. This lifejacket also features a durable neoprene belly-band and a front float that helps dog's keep their head above water with little strain. The Paws Aboard Neoprene Designer Doggy Life Jacket provides ultimate buoyancy and high visibility to keep pets safe on the water. Designed to ensure a cozy, secure fit and plenty of buoyancy, this jacket features an advanced breathable mesh underbelly for proper draining and drying, which provides your dog more comfort and healthier conditions than traditional pet life jackets, which can cause heat exhaustion and chafing.